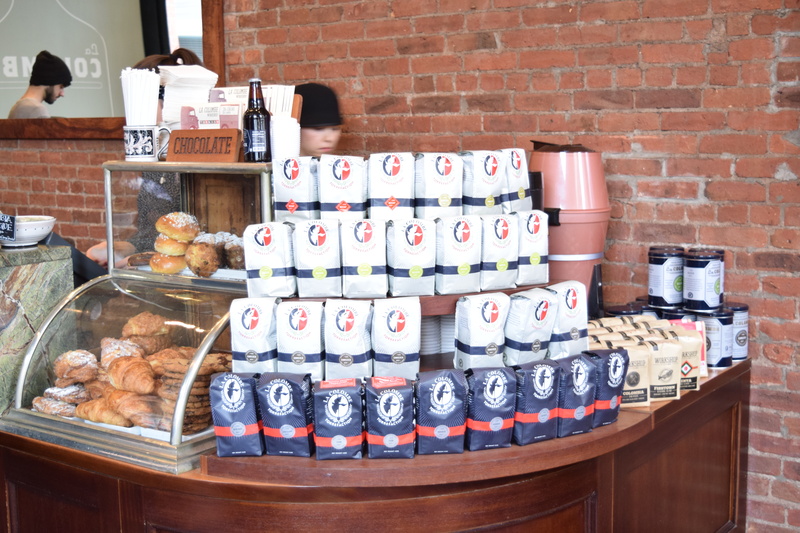 New York is awash with coffee shops, drenched in the soluble solution that is coffee and for good reason too, New Yorkers love coffee. 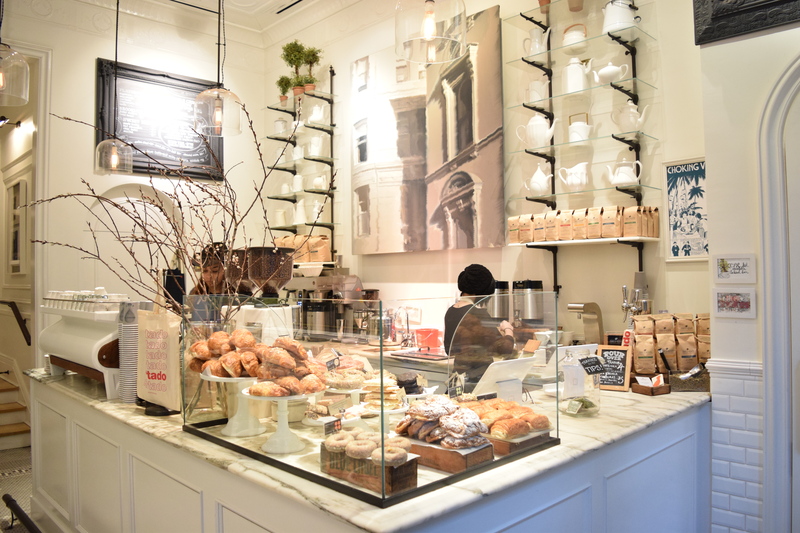 New York’s history is steeped in drip coffee, it’s practically the lifeblood of the workforce, it fuels the early morning rush and props up the afternoon lull. 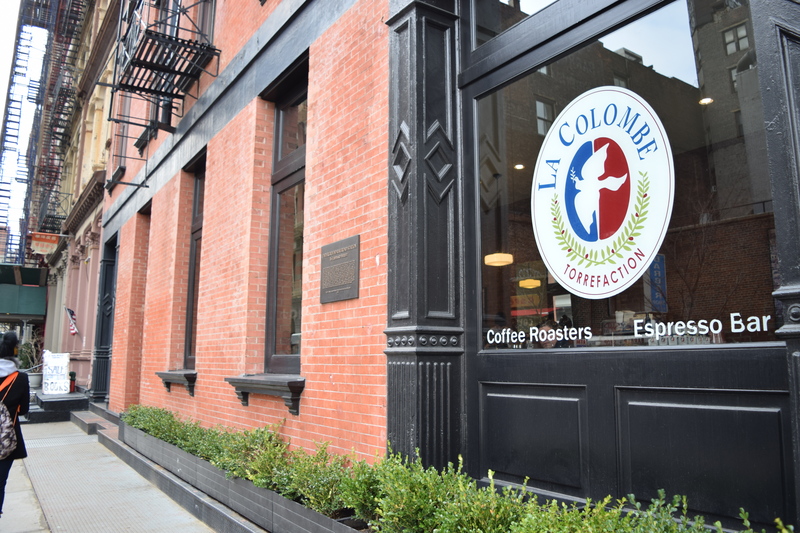 What has changed in New York though, is not the desire to drink coffee, but the desire to drink quality coffee. As the specialty coffee industry grew on the west coast in places like Seattle, Portland and San Francisco, it was obvious where its next big audience would be, the big all consuming apple. 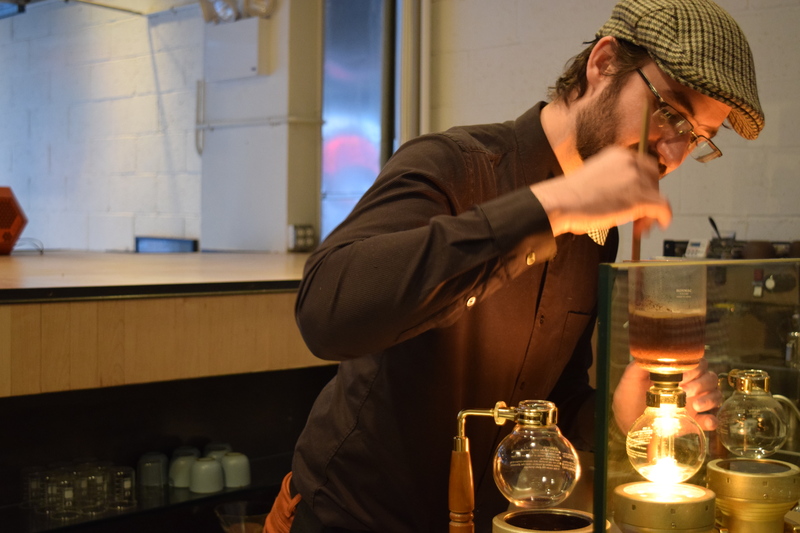 A City with a voracious appetite for everything modern, New York took to specialty coffee like it took to modern European Impressionism, with rapid fascination. An ever growing and ever increasing multicultural melting pot of nationalities and ethnicities, New York now nurtures a cacophony of customs and cuisines in its culinary soup, with one delight transcending the intriguing individualitys of the ingredients in its soup, the universal love of coffee. 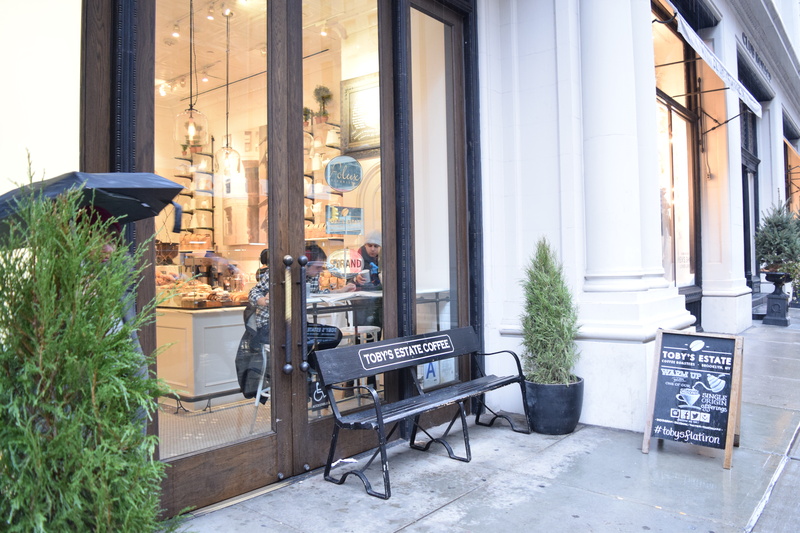 On the fairly quiet West 29th street, there are more people inside Stumptown Coffee Roasters than there are on the street outside. The queue for the coffee counter wraps around its marble top curves into what resembles a members club. What is when entering, a bright and shiny coffeeshop front, becomes a warm dark wooden affair once entering into the lobby of the Ace Hotel. Here it feels somewhat like a lodge, where gentleman should be smoking cigars and drinking whiskey beneath mounted deer heads. Instead it is full of small social clusters, chatting over their drinks alongside a large wooden kitchen table filled with students and workers tapping away on their keyboards. Back in the shop front the drinks are prepared in quick succession as the queue spills out onto the Italian style standing bar at the window. The baristas prepare one filter at a time and this particular day’s filter was the Guatemala Bella Vista la concepcion bourbon varietal being brewed on chemex. We waited by the window for the coffee to arrive in those signature Stumptown Coffee brown cups. On arrival the coffee brought with it aromas of caramel nuttyness and marzipan. A smooth but vibrant acidity featuring plenty of grapes riding on a marzipan backbone. Sweet and well balanced it was a great coffee to start the morning. 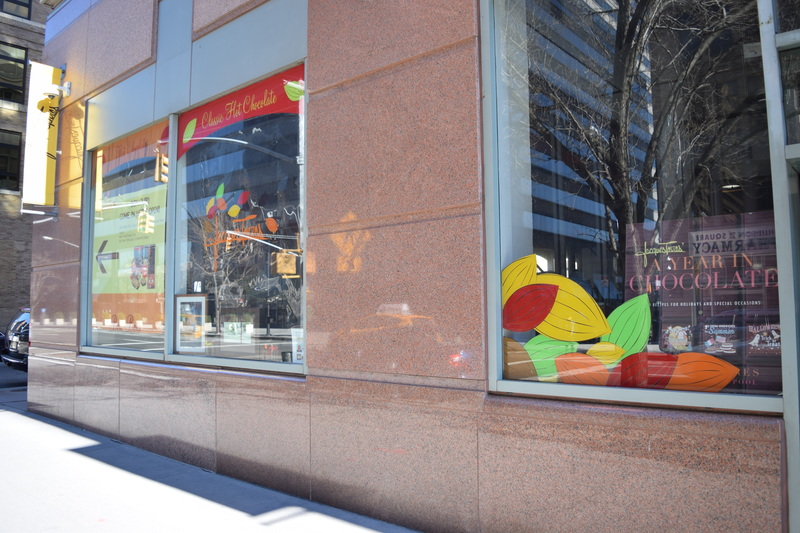 Jacques Torres’ self confessed flagship store is based in the quiet end of Hudson Square just inland from Hudson river park trust. The store is as much for making chocolate as it is for selling chocolate, dressed in orange and silver Jacques principle colours, the shop has a Willy Wonka like costume feel to it. Unfortunately there was no action afoot in the spacious production room at the back, meaning that all attention was reserved for the glass screens protecting their appetising array of small chocolates. Not one to pass up the opportunity to purchase chocolate, we bought a few chocolates for our travels, the best of which being an arbol and chipotle chilli spiced ganache coated in couverture, which had a slow build and long lingering deep spice flavour. 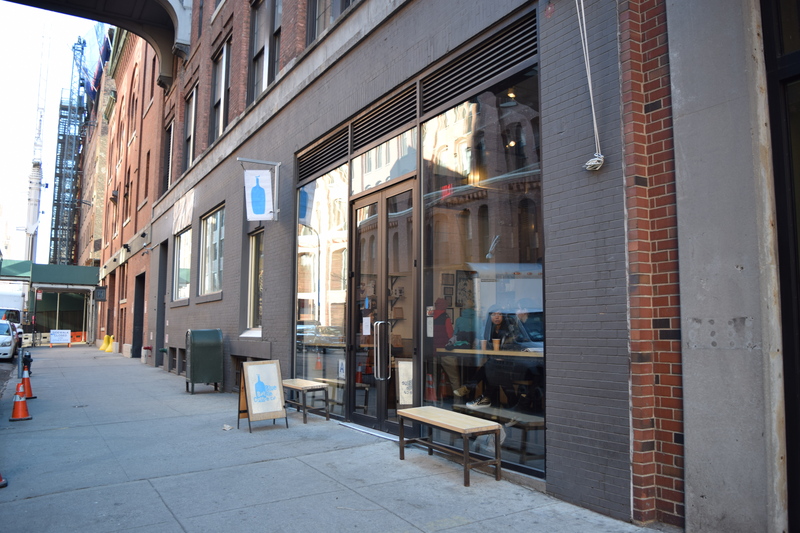 Just opposite the famous Chelsea market is the equally infamous Blue Bottle Coffee Chelsea branch, made notorius by the installation of its upstairs siphon bar. 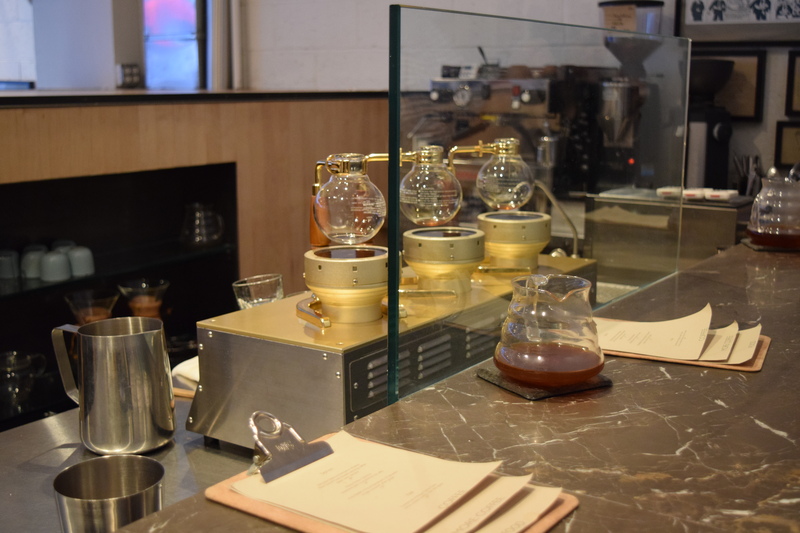 Having recently featured in ‘A Film About Coffee’ flaunting its stylish dedication to coffee, the siphon bar is no less impressive in real life. The bar is set up as it should be, in calm prepared anticipation for its customers, featuring menus that would not look out of place in fine dining and are no less well described. Aida Battles Finca Kilimanjaro has the descriptive attention of a notable bottle of wine and rightly so, these are some of the most loved and laboured over coffees available in the world today. This is a list for connoisseurs, rather than for those with just a passing fancy in specialty coffee. For those with a taste for espresso based drinks or even good filters, the downstairs bar offers a more than adequate selection of coffee beverages, which under regular circumstances would satisfy even the most dedicated of coffee fanatics. This however is a coffeeshop with not just a dedication to coffee, but one dedicated to occasion. 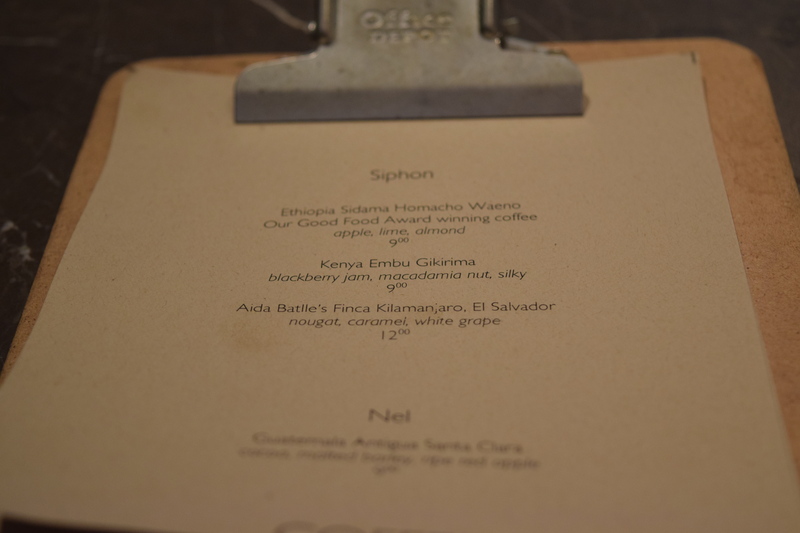 What is available here is an experience designed to pay homage to coffee and those involved it its production. An experience that promotes coffee to its rightful place amongst the epicurean echelons of the gourmet dining experience. Approaching the upstairs bar, we arrived to find it full, which was not entirely surprising. The bar is designed to be an intimate experience with the barista, designating that it be limited to around 10 seats. Taking a few seconds out of his time, the barista enquired as to our gazing fascination at the line of siphons before us, explaining it should only be a few minutes before a table would become available. Thankfully we had arrived just as the seated group were about to leave and were rewarded with the entire bar to ourselves after a couple of minutes wait. Perusing the menu, we began discussing Finca Kilimanjaro with the barista, mentioning our recent introduction to the farm through Square Mile’s processing collection where they had roasted three different processes from the farm, a natural, a pulped natural and a washed version of their bourbon and Kenia varietals. The barista went on to explain that there hadn’t been as much coffee available from the farm this year, as they had been hit badly by roya more commonly known as coffee leaf rust. A worrying window into some of the difficulties farmers are facing in terms of producing quality coffee. In spite of the difficulties faced at Finca Kilimanjaro this year, they had managed to produce no doubt a wonderful coffee, something we would shortly be able to confirm. 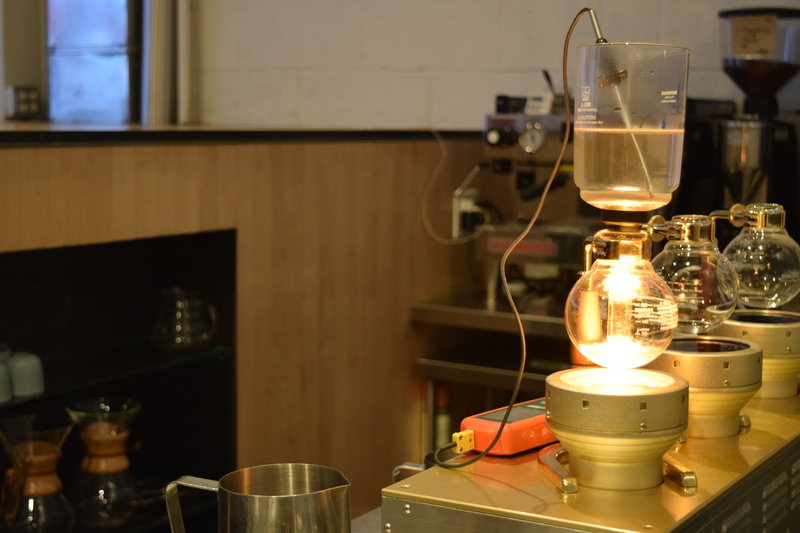 While discussing the coffee, the barista passed around the siphon top with the ground coffee in for our aromatic appreciation. Dry it gave off hints of nuts encased in deep florals. In the cup it added sweet caramel tones to its repertoire, appearing like red amber while bearing a resemblance to ribena. To taste it was boldly sweet, somewhere between burnt toffee and toffee apple caramel over time developing fruitier notes of grape and braeburn apples. The coffee was delightfully clean and well rounded with great texture, no doubt due to the combination of the delicate coffee and the appropriately delicate brew method. Not wanting to miss out on this golden opportunity, it was only sensible to order another coffee from the menu, this time the Ethiopia Sidama Homacho Waeno. Again the barista passed around the grounds to smell, this time the coffee gave off aromas of citrus, red apple skin and elderflower. While the coffee brewed we discussed flavour notes like concorde grapes and how they actually tasted like american artificial grape flavour, alongside whether passionfruit was an accurate bridge between lemon and stonefruit. In the cup the Homacho Waeno appeared like a red tea with very distinctly individual fragrant notes. To taste it opened with complex acidity resembling gooseberry with an apple and grape fruity sweetness that followed. Texture wise it was very similar to a tea with honey, very light with a subtle stickyness to it. Again this was another coffee that had benefited from the light body that brewing with a siphon had provided, giving room for the florals and fruits to blossom in the cup. All in all this was a wonderfully unforgettable experience where coffee and devotion meet together for our personal pleasure. 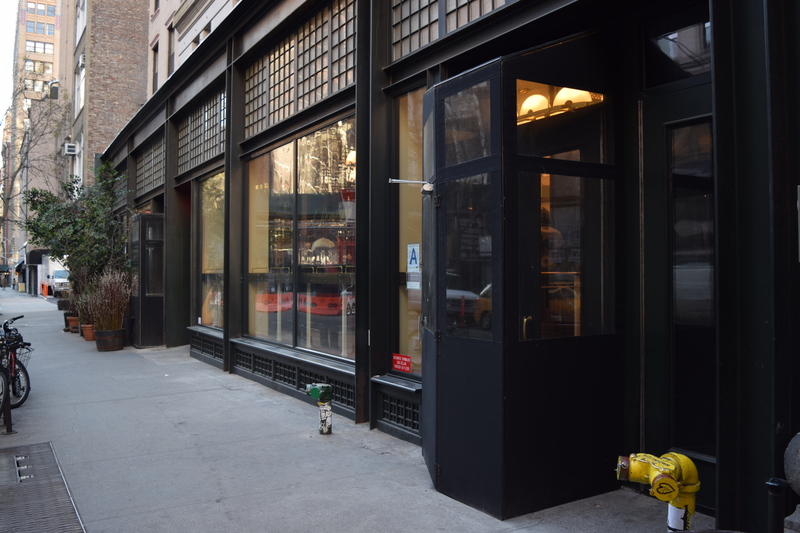 On 5th Avenue is the small but stylish Toby’s Estate just round the corner incidentally from Dough, which happens to serve some of manhattans best donuts. On entering through its largely glass exterior Toby’s Estate is clean, bright and somewhat decadent, with gold framed mirrors and stylishly written wall menus. 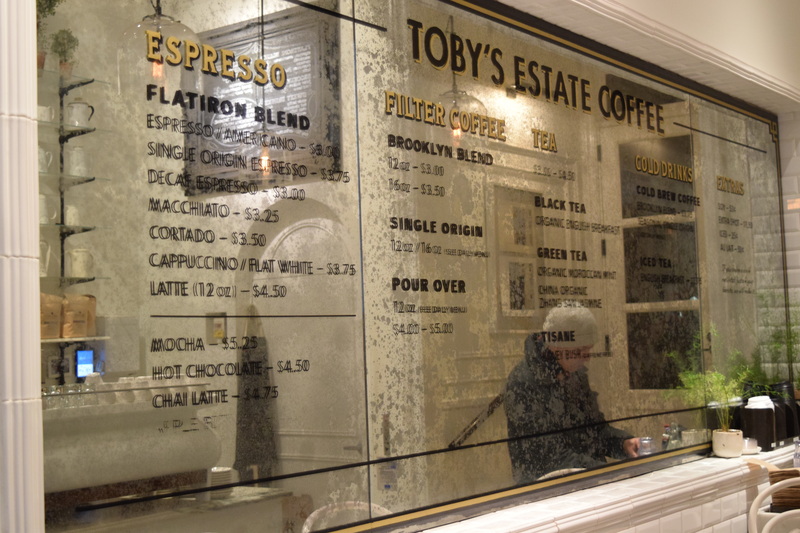 Toby’s feels like a coffee parlour or boutique for want of better terms, creating an air of quality around its coffee before you’ve even tasted it. 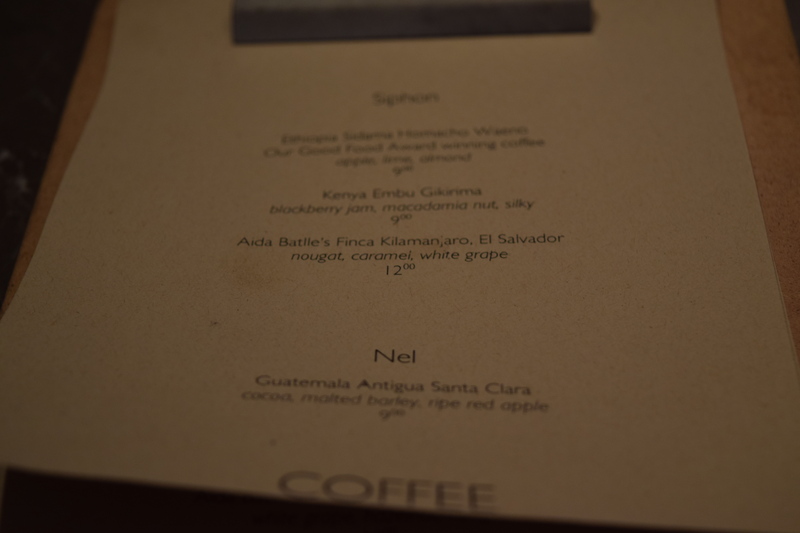 Providing their own roasts and a short filter menu, I opted for their Honduran La Escuela a washed Catuai varietal as a V60. Coffee ordered we took a seat at the window looking out over the street where we flicked through some of the local papers provided by the door. On arrival the coffee was a dark almost purple in the cup, giving off aromas of baked plum sponge, red grapes and liquorice. To taste it opened with a bitter melon giving way over time to a blood orange with the light sweetness of maple syrup. Well rounded it had a lightly chewy, juicy and syrupy mouthfeel to it. Toby’s is fresh, light and enlivening and had I not just eaten some donuts, they have a great range of cakes too. 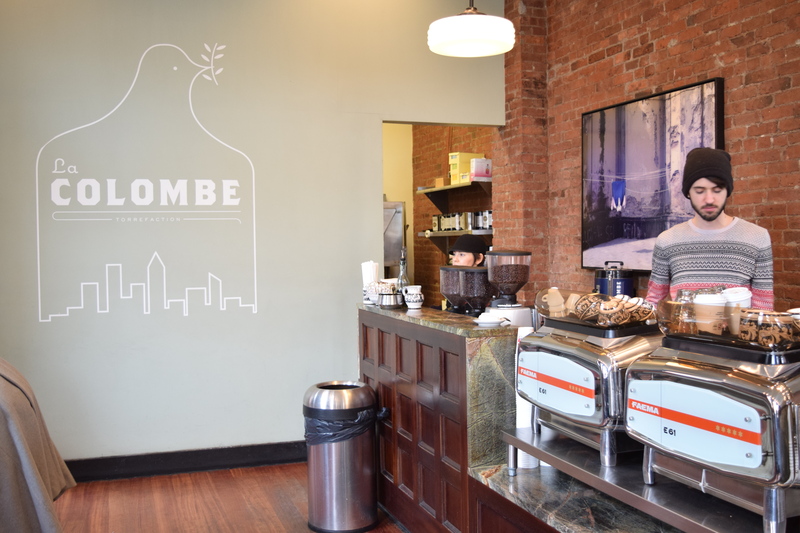 Down on Church Street in Tribeca is a La Colombe with a neighbourhood cafe feel to it, a little slower and a little more homely that their other branches. Still the emphasis is on quality coffee production, which is obvious by the two Faema E61’s sat side by side on the counter top. With a preference for brewed over espresso coffee, I enquired as to the filter they had available, the barista directing me to the Colombia Sanroque, a washed caturra varietal from Huila, Colombia. 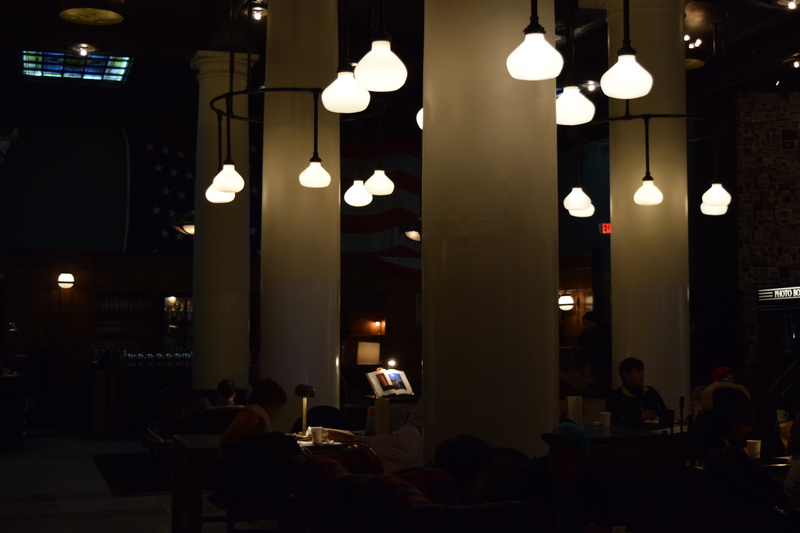 Taking a seat and relaxing to the sound of clinking cups and bursts of steam from the espresso machines, it was noticeable that everyone here was talking or reading, absent was the ubiquitous coffee shop sound of keyboard clattering. With a call from the counter my coffee was ready, arriving in a moulded clay mug, which appeared to have been brought home by Todd Carmichael from one of his many trips to South America. In the cup the coffee gave off earthy aromas with hints of cherry and sherbert. To taste it was like a dark chocolate black forest gateaux with a little tart lime coulis on the side. 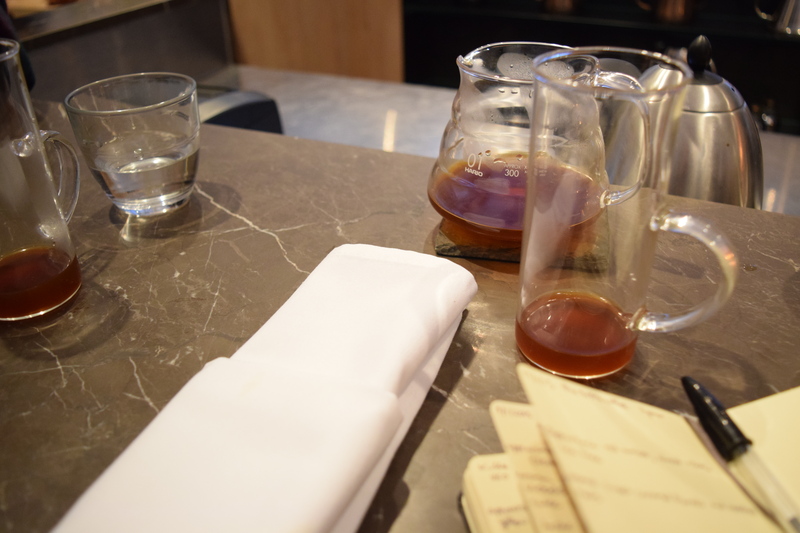 There was something of the natural about this coffee, even though it was a washed, there was a little boozy tang in the bold and big mouthfeel, the tasting notes including apple cider tended to agree with this. 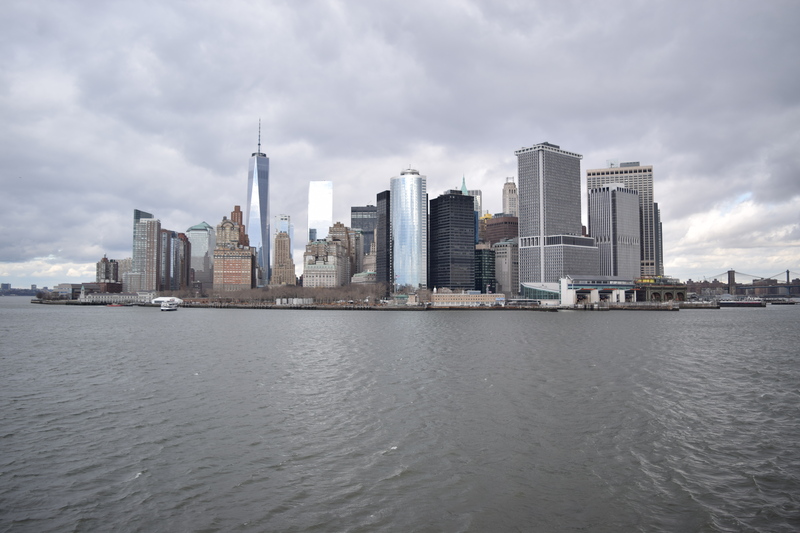 This entry was posted in chocolate, coffee, New York and tagged Blue Bottle Coffee, chocolate, Coffee, Jacques Torres, La Colombe, New York, Stumptown Coffee, Toby Estate by commoditiesconnoisseur. Bookmark the permalink.